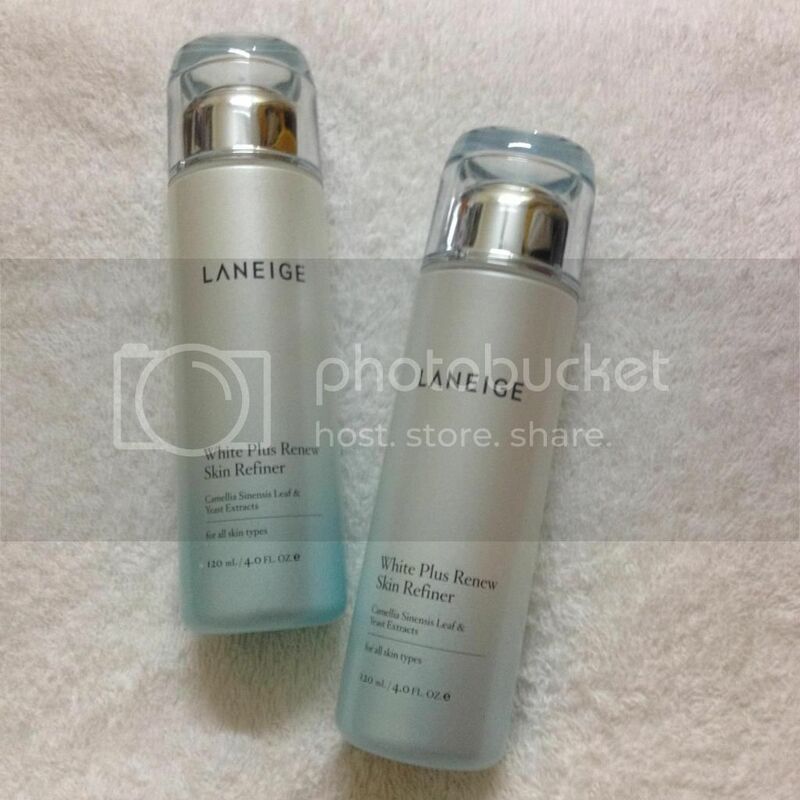 As promised, first thing to do after I'm back updating this blog is to do reviews on my current skincare products which you may already know, the upgraded (2014) White Plus Renew line from Laneige. I used up my previous skincare product line around March, the Flebote White Crystal Brightening line from TheFaceShop (you can check out all the reviews from the Review List tab above) and after 6 months of using the whole line, I do feel satisfied with the result but starting 2014, I decided to go for products without paraben so for the whole month of March I was searching for a new skincare line and after trying lots of samples from different Korean brands, I decided to go for this skincare line. The first product that I'm going to review from this skincare line is the toner which is the White Plus Renew Skin Refiner. Brightening skin refiner that instantly soothes the skin and brightens it over time. The rich and soft texture of the product instantly soothes and softens the skin and brightens it over time with continuous use. As a perfect complement to Original Essence, the skin refiner helps to maintain the optimal water-oil balance of the skin and moisturizes just like what an emulsion does. The product is made using MelaCrusher™ technology that promotes the self-destruction of melanin pigments, thereby keeping the skin always looking radiant and healthy. Also known as melanin bio vacuum cleaner technology, this technology is based on the concept of Auto (self) phagy (consume), that builds up the cell's innate autolysis power against melanin deep inside the skin. In other words, it accelerates the self-purification system of cells that regulate melanin and waste materials that basically contribute to dull skin and pigmentation. This essential step stimulates a cell to break down melanin and eliminate yellow and red undertones also age spots, resulting in a flawless and radiant-looking skin that is 2 tones brighter. Also, the entire line of White Plus Renew products provides "4-free" safe brightening care: mild and free of Dioxane (compound that is known that can irritate eyes and respiratory tract), artificial colourant, mineral oil and raw animal ingredients, making the range suitable for sensitive skin types. Mild on skin yet powerful whitening agent, Green Tea effectively inhibit melanin generations and block Melanin bridge. Also, it's a rich moisturising agent. Originated from mushroom, is a new concept autophagic whitening technology that restores the melanin self-decomposing capacity of the skin for flawless bright skin. An effective anti-oxidant that helps to restore healthy colour to the skin by strengthening blood vessels in the dermis and helps block melanin transfer to achieve brighter skin. As you can see, the product came with its own box and later on you'll know that all the boxes from the same skincare line has the same style of packaging. The box is white with blue pattern on the side and if you notice, there's the circle with turquoise pattern on top of the label, which means it belongs to White Plus Renew line. I saw other skincare line from the brand before and it's different colour for different line. To my knowledge, Laneige labeled their product differently according to regions, as I heard the ones in the South Korea and US have different names. Here in Malaysia, this is how it's labeled, the skincare line's name (White Plus Renew) first, with the product's name (Skin Refiner) comes after that. I got samples from South Korea before, and it's labeled the other way around and of course the descriptions are in Korean language. From the back of the box, it says there that the product need to be used up within 12 months and right away after dispensed. There's a product leaflet included in the box as well. This is bottle! It's soooo pretty, right? Well, it is to me! hikhik I think it's glass though. The cap is transparent with silver coloured dome-like inner cap that basically just cover the opening of the bottle. The soft turquoise colour at the bottom that seems to dissipates towards upward~ and it's actually metallic which makes me love it even more. I think you can see it from below photos. As this is the full size product, it has 120ml of product in it. My previous toner is 150ml so I think this gonna last for about 3 months of continuous use (day and night). Good thing is, before using the the product for the first time, I found the opening was sealed so do check before purchase. There's a product series number at the bottom with the manufacturing date as well. As I bought this in March, it was nice as I got a fresh batch of product with only about 3 months after manufactured. Water, Butylene Glycol, Niacinamide, Ascorbyl Glucoside, Camellia Sinensis Leaf Extract, Yeast Extract, 1,2-Hexanediol, Glycerin, Glyceryl Stearate, Glyceryl Caprylate, Dimethicone, Cetearyl Alcohol, Squalane, Stearic Acid, Ethylhexyglycerin, Caprylyl Glycol, Triethylhexanoin, Palmitic Acid, PEG-20 Glyceryl, Isostearate, PEG-60 Glyceryl Isostearate, Hydroxyethyl Acrylate/Sodium Acryloyldimethyl Taurate Coplymer, Potassium hydroxide, Disodium EDTA, Phenoxythanol, Fragrance. Ascorbyl Glucoside is a stable form of Vitamin C. It’s made by combining Vitamin C with Glucose basically it is an antioxidant. When applied on the skin, it breaks down into L-Ascorbic Acid (pure Vitamin C) which has powerful antioxidant properties and inhibits the synthesis of melanin. Well, as it contains fragrance, it smells like floral to me. It's not really that strong and it dissipates in minutes. The texture is watery but it's milky as well. Absorbs into my skin quickly as well. To be honest, I've been using this toner for about 2 months but not the full size product, as I have the trial set version with 50ml product in it along with one 15ml trial kit, and as I just finished them, I have to say, I really like its texture and how it absorbs into my skin quickly. The trial set version in on the right. How do I apply this toner? By dispensing it on my hands and apply it directly on my face. No need cotton pads! This toner or to be exact Skin Refiner, is supposed to work well with the Original Essence from the same skincare line. Its function is to prepare your skin for the essence to be easily absorbed. Final verdict: 5/5. Fully satisfied with the product! Definitely repurchase! As you may already know, up to April haul, I bought all my skincare products from local store here in Malaysia but this is the first time I bought from a counter in a departmental store. I got this from Laneige counter in Parkson KLCC with a retail price of RM105. I guess that's all about the product. Do share if you ever tried this product or just tell me what do you think. If you're curious about the result, stay tuned as I'm going to share about it soon in another review for another product from the same skincare line. Until next post, au revoir!